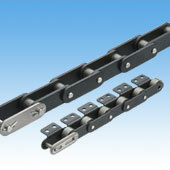 An attachment conveyor chain with flat link plates and double the pitch of standard ANSI roller chain. Uses special oil-impregnated bushes. Provides lube-free, long life operation. Uses special oil-impregnated bushes for lube-free, long life operation. The inner and outer link plates have a black oxide coating, providing slight corrosion resistance and a high-grade appearance. Double Pitch Chain has high precision across its entire length, making it ideal for relatively long span, low speed conveyance. Can use R or S rollers, depending on your application.